Saw this wing-tagged (and banded) Great Egret in Harrier Meadow this afternoon, reported it, and got an immediate response from Susan Elbin, Director of Conservation and Science for New York City Audubon. Susan reports that another of the 13 Great Egrets that were wing-tagged that day in Jamaica Bay was seen in Saratoga, N.Y., on August 19. 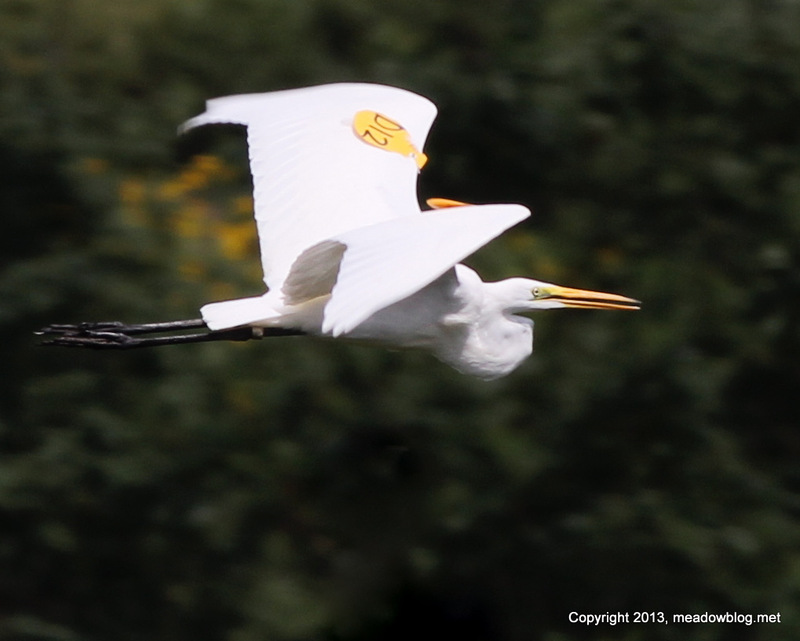 Note: The Meadowlands also hosted a tagged Great Egret from Jamaica Bay last summer. Link is here. 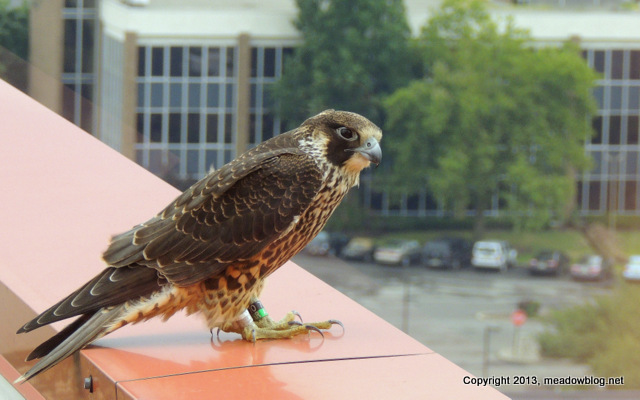 Remember that banded Peregrine we photographed on Lyndhurst office building early last month? Bill Uhrich of The Reading Eagle did a column on the raptor this week. [A photo of the bird] showed the leg bands that Pennsylvania Game Commission Peregrine specialist Art McMorris and his crew placed on the nestling in Reading on May 31. The bands once again proved their value as a wildlife management tool by allowing biologists to track falcon movements. It was particularly good to see that this peregrine is out and healthy, since at the time of her banding, Art detected a low-level trichomoniasis infection and sent her up to Peggy Hentz at the Red Creek Wildlife Center near Schuylkill Haven for a round of antibiotics. The bird was undoubtedly infected by the pigeon prey that she was fed by her parent peregrines, which have developed an immunity to trich. Link to the column is here. 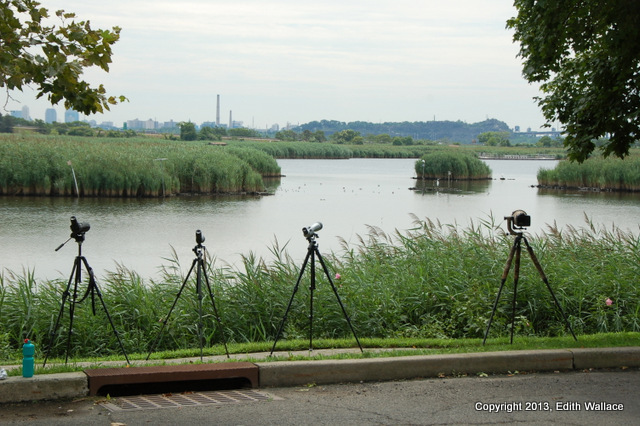 Get out your binoculars — and send us your Meadowlands Big Year totals as of August 31! 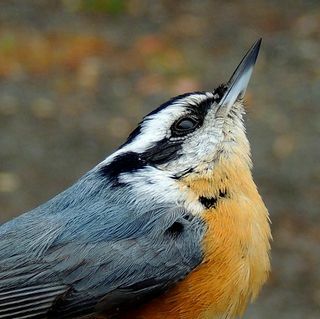 The goal is to see as many different bird species as possible in the 14 towns of the Meadowlands District over the course of 2013 — and also to have fun birding. To ensure a level playing field, all birds must be seen in areas open to the public, or on guided walks or banding events in such places as Harrier Meadow or the back of the Kingsland Landfill. The idea is to promote birding in the Meadowlands, and to give area birders a competition that does not require as much travel (and gasoline consumption) as, say, a New Jersey Big Year. To make this as fair as possible, we have two divisions: Meadowlands residents and non-Meadowlands residents. Where have all the birders gone?